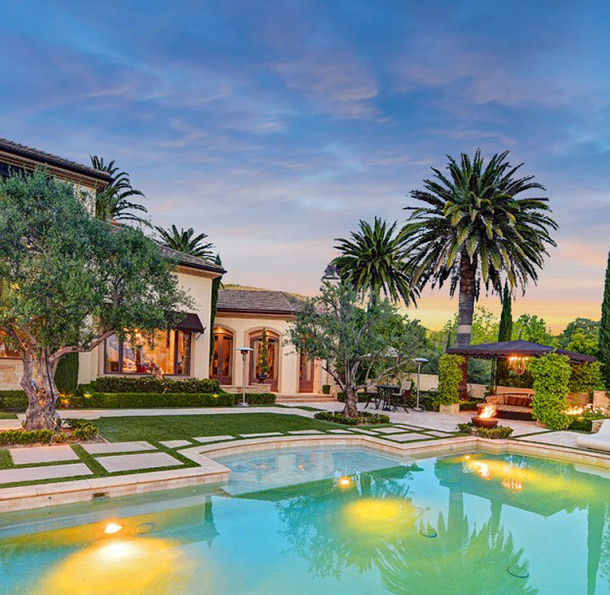 Perfectly situated amid the lush, rolling hills overlooking historic San Juan Capistrano, 27112 Highland Drive is a lavish, sprawling estate that artfully blends resplendent European grandeur with spacious California tranquility. Less than ten miles from the Dana Point coastline and midway between Los Angeles and San Diego, this six-acre residence offers stunning ocean views and a wealth of beautifully appointed indoor and outdoor spaces, including a fully equipped gym, guest house, tennis court and observation deck, 800 sq ft turf sport court, saltwater pool and spa, temperature-controlled wine cellar, and movie theater—not to mention, a certified-organic 430-tree lemon grove. The main house, a Venetian-style manor enriched with ornate detailing and black walnut floors throughout, is a study in classic elegance and state-of-the-art luxury. The moment you step foot through its stately entrance—a striking, 11’2” front door, framed by decorative stationary glass paneling—onto the classic parquet wood floors of the sweeping foyer, you’re transported into a world of opulence and finery that permeates every corner of this extraordinary residence. Past the handsome and sumptuously accented parlor, a sunken, generously-lit Victorian living room awaits. Pause and relax here, open one of its many French doors to explore the formal garden, or ascend a grand staircase into an extravagant master bedroom and private sitting room, with an uninterrupted view of the expansive surrounding hillside and nearby ocean. An ideal space to luxuriate, the accompanying 420 sq ft master bath and steam room, and adjoining 308 sq ft master closet is equal parts decadence and serenity—a welcome theme that persists throughout the six bedrooms and nine bathrooms of the main house. Entertain guests in the ample heart of the home, a magnificent open-concept family room, kitchen and full bar, with travertine stone floors and beautifully crafted cabinetry and wainscoting that transitions seamlessly outdoors via floor-to-ceiling, sliding pocket glass doors. 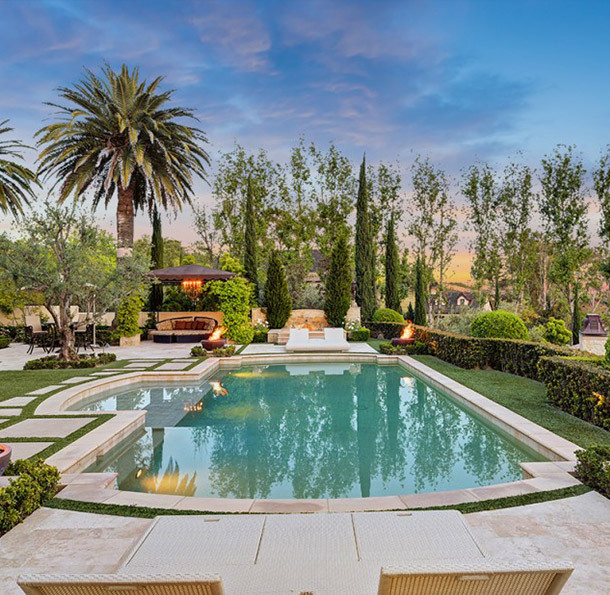 With an outdoor fireplace and year-round Southern California weather working in your favor, you’ll take full advantage of the exquisite poolside loggia, multiple covered patios, and large, Viking-equipped outdoor kitchen, which even boasts a full-size pizza oven. Don’t be fooled by the classical elegance of this residence. Built into the house are fully integrated, top-of-the-line AMX and Vantage automation systems custom-designed by Cantara for total convenience and efficiency, operated via touchpads stationed strategically throughout the property. 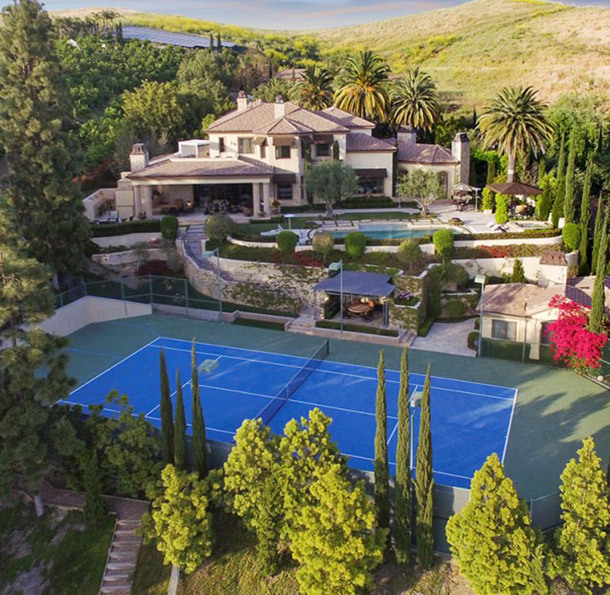 This includes: gate controls, HVAC customization, intercom communications, lighting, security and surveillance, shade control, pool and spa controls, and more. 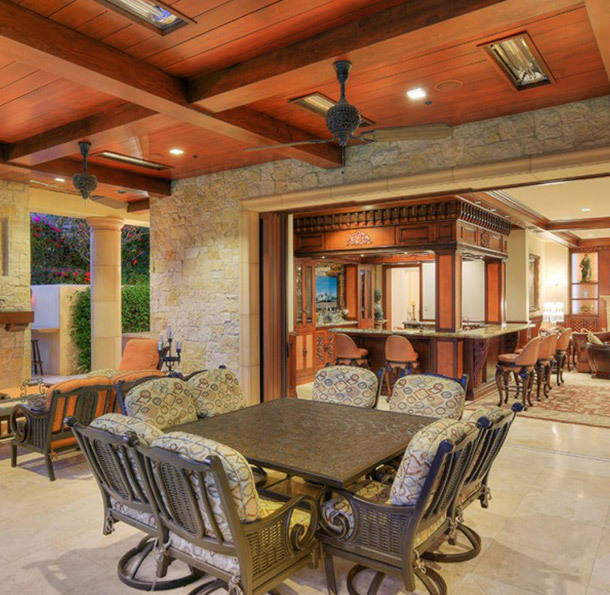 Sonance Symphony speakers adorn the ceilings throughout the house, gym, and guest house, as well as nearly every outdoor area, offering superior audio quality no matter where you are in the home. You’ll find most bathrooms in the main house outfitted with gorgeous Neorest washlets, and kitchens sporting Sub-Zero, Dacor and Viking appliances. Out by the lemon grove, massive solar panels do their part to provide additional power to the property. At the end of the day, feel free to curl up and watch movies with up to six people in your own private theater on an immersive 100-inch screen and iVision 30 digital projector. Selling Your Coastal Orange County Home?